Are you playing or is this serious? The owner does not know what to do. Your dog meets another dog in the park and they start chasing each other and playing… or at least that is what it looked like at the beginning. However, they are now making a lot of noise and the owner does not know whether they are still playing or something has gone wrong and it is better to separate them. How can we know whether they are playing or starting a fight? It is not always easy to know whether they are playing or not. When playing, dogs normally growl, bite, leap on other dogs, chase each other and even try to mount each other… but all this without a real intention to hunt, mate or attack. 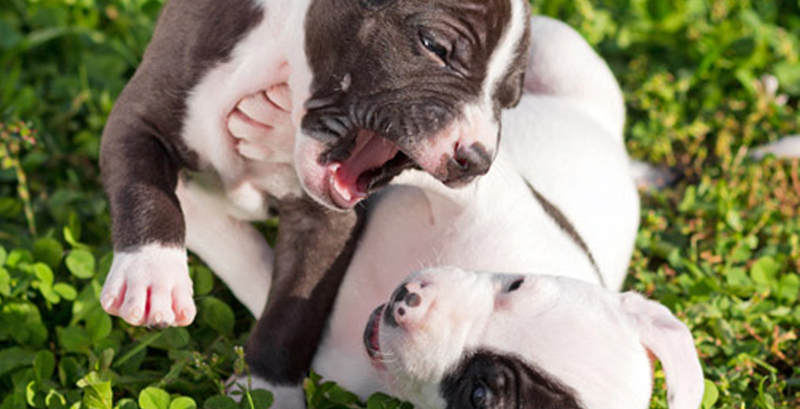 For many owners there is not much difference between a real growl or a play growl, and, in some cases, even dogs may mistake it and turn the game into a real fight. To avoid any doubt regarding their playful intentions, dogs usually emit signals that remove “any seriousness” from their behaviour. Elbows on the ground, raised hindquarters, a relaxed and attentive attitude, opened mouth, acute bark, high tail and ample movement: this is a familiar signal for many owners that serves as an invitation to play. Dogs use all of these signals when they want to play or when they believe there may be a misunderstanding, for example, when they play with unknown dogs or when they are about to carry out actions that might be confusing, such as jumping on us. Hopping while bending their elbows and without moving from where they stand or abruptly approaching and moving away from their game partner are other signals that serve as an invitation to play. These signals help owners to distinguish between a game and an attack. However, the lack of signals does not mean that dogs are not playing. In this case, use different resources to decide whether it is necessary to stop the interaction between dogs or not, such as the presence of wounds, repeated attempts from one of the dogs to stop the game, lack of interest in the game, excessive control, increased excitement, high barks that turn into lower and more threatening tones, and so on. When this happens or if you are not sure whether the dogs are playing or not, it is important to separate them before true aggression begins.